On Sunday 20th November the SOS Liverpool Plains Group showed the documentary Gasland to 70 people at the Quirindi Royal Theatre. Following the movie Rosemary Nankivell spoke on CSG at a local level. Kirrily Blomfield President of SOSLP was very happy with attendance numbers. Kirrily was delighted that many of the audience stayed after the showing of the movie to enjoy refreshments and to discuss the startling facts about CSG that this movie exposes. 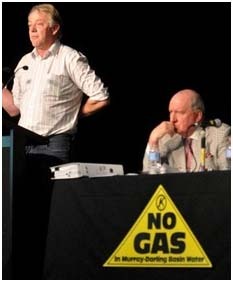 The coal seam gas extraction saga dominates media interest, while debates continue as to its relative environmental friendliness compared to coal burning. Some commentators see farmer land rights and struggles in purely financial terms, promoting farmland and its production areas as flexible and malleable, as society’s needs change. CCAG has always, and continues to argue that prime production land and its water resources should be sacred, and should be fully quarantined from the ravages of mining activities. As the fight to highlight these adverse mining consequences continues, CCAG congratulates its foundation executive member Fi Simson on her appointment as president of NSW Farmers. CCAG welcomes the announcement that NSW will at last have a government inquiry into the Coal Seam Gas industry thanks largely to the efforts of Greens MP, Jeremy Buckingham, who recently toured CSG affected communities and met with residents to hear their concerns. The NSW Parliament has agreed to the most comprehensive CSG inquiry ever initiated in Australia by gaining bi-partisan support for what is an essential investigation into the environmental, social and economic issues relating to the CSG industry. This inquiry is distinct from the recent Senate Inquiry. 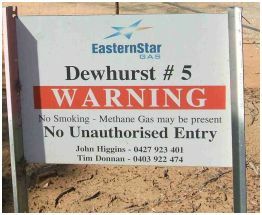 It is focussed on the NSW environment and the NSW laws that are responsible for approving and regulating CSG. It is not limited to the Murray Darling Basin and will bring together regional communities and farmers with the city and coastal communities. Another important speed bump for mining development in our State.